This blog post contains something I rarely do. It references a book I have read and want to recommend to accountants who are looking to the future. 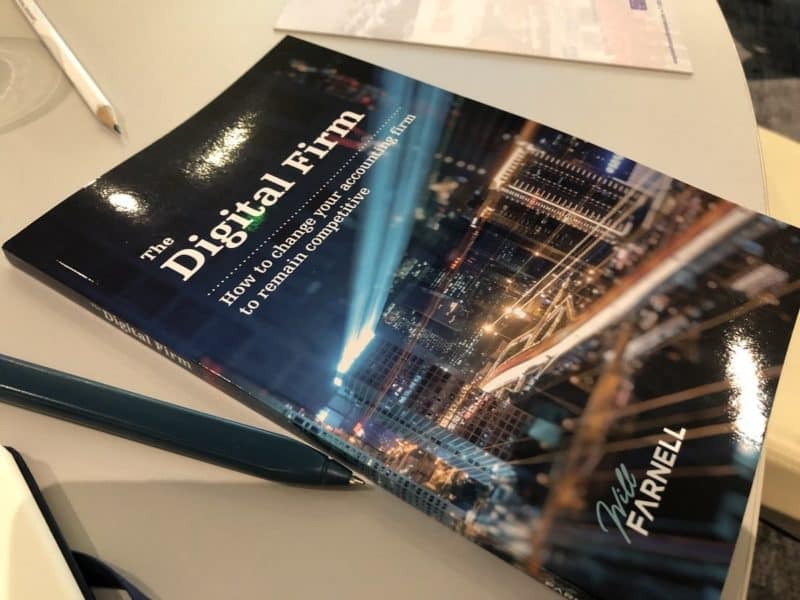 The Digital Firm is written by an accountant, Will Farnell, who also published it in 2018. The book is subtitled: How to change your accounting firm to remain competitive. And the advice it contains dovetails very nicely with the topics I address in my latest talk: The Rise of Robo-Accountants – and how to beat them. By his own admission, Will is not a typical accountant. 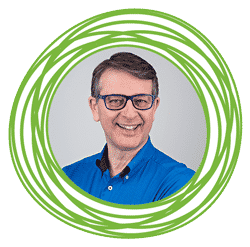 He’s an entrepreneurial big-picture guy who has long sought out the best tech to help his team provide great client service at Farnell Clarke. The firm has won various awards and was one of the first 100% cloud practices in the UK. The Digital Firm is a guide to help any accountant who wants to future-proof their firm. The alternative is to sit and wait for change to prompt you to make knee-jerk reactions that may be too-little, too-late. As I explain in my talk, the pace of change is hotting up. Previous developments have typically made it easier to provide recurring compliance services to clients. Many of the newer developments will force accountants to refocus and revise what services they primarily offer to clients. The book is easy to read, clearly laid out and logical in it’s contents. Reading it will give you insights into how you can effect the changes you may be considering for your own firm. It includes what seems to be an honest and realistic appraisal of the changes Will and his partners have been making at Farnell Clarke since he set up the firm in 2007. There are also a number of case-studies referencing other firms of accountants that have also become digital firms. Will looks at trends that are affecting accountants and why it’s important to take action to future-proof firms now. He advocates using software to work smarter and to become a truly ‘digital’ firm. Chap 2: Compliance is dead, so what’s the strategy? Contrary to the chapter title, Will acknowledges that compliance work won’t die. But it will soon be so well automated that accountants will need to focus on other services to secure valuable fees from clients. That focus for firms will be profit preservation (Will says ‘income preservation’, but I prefer to be more specific). This will often result in you taking on more clients which will require new systems and processes if you are to remain in control and on top of things. How automation can make your practice more efficient and how Farnell Clarke communicated the change from time-based fees to advisory services with their clients. I love the idea of learning from early adopters, like Farnell Clarke, as I’m not a fan of paying the premium price to be pioneers in practice. This chapter ends with a surprising ambition which I didn’t quite follow. Will suggests that the firm will “need to get to a point where [they] can do compliance for free.” Having said that, I don’t recall the last time I read a book aimed at accountants and only disagreed with one sentence! 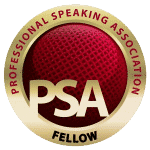 This chapter goes beyond the traditional recruitment tips of ensuring the promised work will be appealing and that the office culture is attractive. Will explains the need to recognise that millennials are not all interested in the same things as older accountants. One of the members of my Inner Circle has long made the same point as Will that it’s better to recruit people with the right mind-set as you can always train them to be more technically proficient and to use your software efficiently. Here Will sets out some of the pragmatic challenges of the move and wisely notes that there is no one thing that will be consistent for all firms. Again, this is a point I make in my talks. The issues you need to address will depend on the a variety of factors related to your firm, your people, your clients and the range of services you currently offer. The link to which Will refers is between your services, marketing, sales and communications (Internal and external). You need to develop an easy to manage workflow and to allow younger staff and clients to keep you abreast of new trends in communications. Again, I make similar points in my talks when I ask whether any millennials are involved in the choice of apps and technology you use in the office? If you are a regular reader of my blog you will know I often debunk the hype around marketing generally. Will seems to share my perspective as he notes that “Marketing is a wasted activity unless it is closely linked to what you re trying to achieve….It is no longer merely about getting new clients.” In this chapter he explains the importance of maintaining a meaningful online precence. Will has sought input from Karen Reyburn, a marketing specialist for accountancy firms, who shares much excellent wisdom in this chapter. I’ve long been a fan of her no-nonsense approach. Like me she debunks the hype around social media and blogging to stress that you need to allow a fair amount of time for a content marketing strategy to take effect. The process of bringing new clients on-board needs to include positive first impressions. Will shares his experiences of simplifying and standardising this process in his digital practice. He explains how his firm does this and the benefits that flow from his approach and the software he uses. Here we learn how Will’s colleagues encouraged him to step back from day-to-day operations in order to concentrate on strategy, business development and business alliances. Will shares his experience of learning to leave his teams to get on with the client work. The approach demands a certain level of staff and support that few sole practitioners I work with would want to engage. But equally Will’s experience may tempt some to find a way to get to the same position. It depends, in part, why you’re in practice. I will be addressing this in a future blog post. At the end of the book you’ll find more about Will, his partners and the various people he interviewed or who contributed to the book.